Siddal were on a the wrong end of a close score line for the third game in a row as another solid performance went unrewarded at second-placed Thatto Heath yesterday. The seventh-placed Chevinedge side lost 24-22 and their hopes of making the play-offs have been dashed. They started in determined fashion with stalwarts Byron Smith, George Ambler, Danny Williams and Gareth English again leading from the front. Jack Georgiou and Danny Rushworth were also prominent as the pack gave as good as they got against the bigger Thatto forwards. The opening exchanges were well contested as both sides completed their sets and kept mistakes to a minimum. Siddal opened the scoring after 14 minutes when half backs Christian Ackroyd and Jake Smith moved the ball out wide to another promising youngster, Henry Turner, who forced his way through to touch down. Gareth Blackburn’s kick narrowly missed the target. Thatto almost levelled after 20 minutes, when a 40/20 kick resulted in a quick tap and home prop Max Dudley spilled the ball over the line as he was tackled fiercely. Five minutes later a spell of pressure led to big prop Mike Stark touching down. Half back Jack Jones converted and the home side edged ahead 6-4. Siddal soaked up more pressure but stood firm with Cole Wilson, Canaan Smithies, Eddie Ainley and Freddy Walker prominent. Just before half time, Siddal showed their attacking prowess as Turner set up Lewis Hosty to run around the home defence and touch down by the side of the posts. Blackburn’s kick gave Siddal a well deserved 10-6 lead. That advantage was stretched after 46 minutes when Jake Smith’s last tackle kick was followed up by Blackburn, who forced a drop out. From the resulting set another Smith kick was taken by the returning Connor MacCallum, who forced his way over. Blackburn’s kick gave Siddal a healthy 16-6 lead. Thatto then had a game-breaking 10 minute purple patch. After 51 minutes second rower Connor Dwyer broke down Siddal’s flank and passed to centre Cory Lee, who touched down. Straight from the kick off Siddal were penalised. Thatto found space again down their left flank and winger Niall Allen scored by the flag. After 61 minutes a high ball caused confusion in the visitors’ defence and Chris Hull scrambled over the line. Jones landed two of the three conversions and then a 72nd minute penalty for holding down in the tackle to make it 24-16. The visitors gave themselves hope with two minutes left when player coach Gareth English was unstoppable from five yards and Blackburn converted but time ran out with Siddal finishing on the front foot. There was again much encouragement to take from the performances of Siddal’s young players. Skipper Byron Smith was man-of-the-match for the second week running. 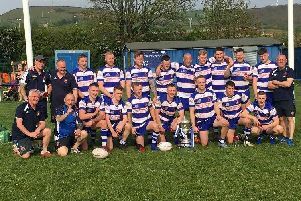 Siddal’s Yorkshire Men’s league outfit made the long trip to Nottingham Outlaws in a Premier Division clash and boosted their hopes of a play-off place as they won 30-26.